If you attended the Link FANFARE on Saturday at Desert Vista and picked up a sunshade, be sure to use it as it could mean a prize for you! 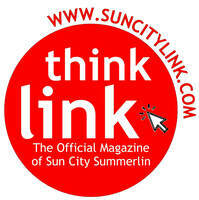 Starting today, the Link is debuting its SPOT THE DOT contest, where a weekly photo of a sunshade in use will be featured on suncitylink.com. 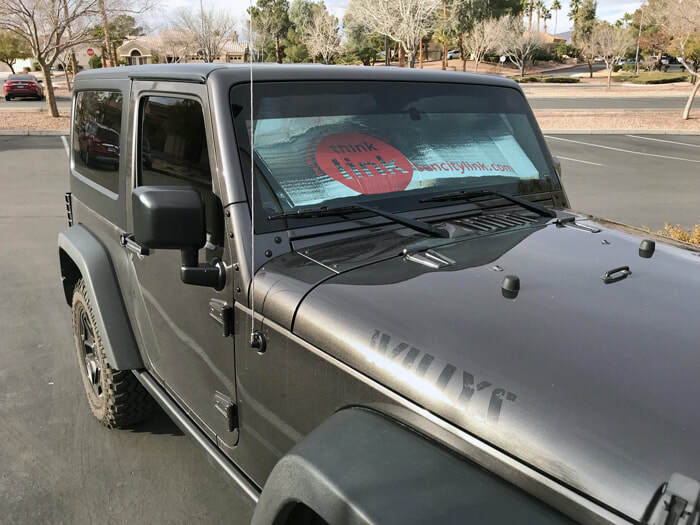 If your car is the one featured showing the sunshade on your windshield, head to the Link office at Mountain Shadows to collect your prize. Good luck! Starbright Theatre Show Is Four Times the Fun! Michael told me I would have to wait and see. Not only can these four performers sing, but man can they dance! The show is choreographed by Paul Holmquist, and the four principals danced for an hour and 40 minutes – Continuously! You get tired just watching them. The four performers were Tim Winski, Katch Gray, Taylor Campbell and Colin Cahill. These four are one of many companies that perform for Chapquist Productions, and they are involved in many of the “Four” productions. “Four By Four” premiered at the Starbright Theater in 2015 and, along with our other productions, has appeared to sold-out performances in showrooms, theaters, stadiums and luxury cruise lines worldwide! Another show from this production company is “Brava Broadway! – Celebrating the Great Ladies of Musical Theater,” which will have its world premiere at the Starbright Theater on February 20. Tickets for that show are on sale now at suncitysummerlin.com. After watching the show, I figured out that the fourth “B” in the show is a tribute to Barry Gordy, the founder of Motown Records. 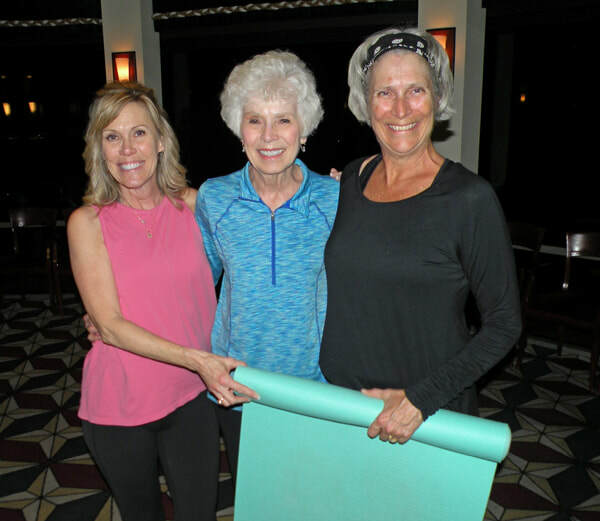 The Summit Restaurant was transformed on January 23 as the dining room’s tables and chairs were replaced with smiles and yoga mats. 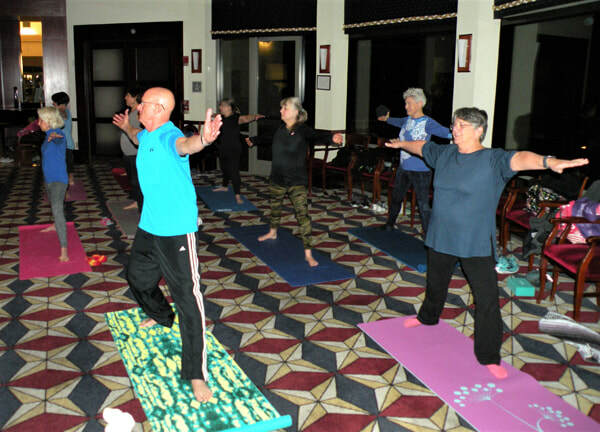 The beautiful skyline of the city was the backdrop for the Health & Fitness Department’s newest class “An Evening of Wine and Yoga.” Twenty-five residents with yoga skills ranging from beginner to advanced practiced together. 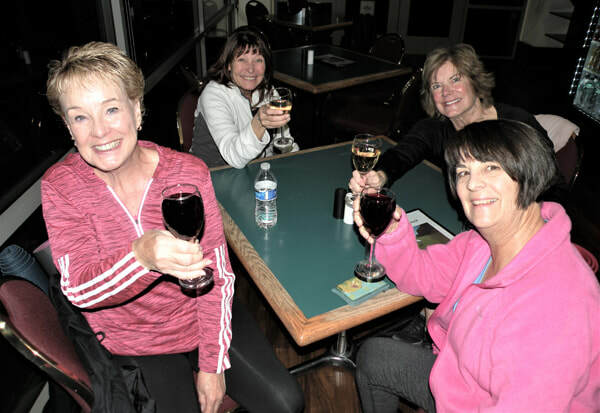 Many stayed for happy hour and laughter was had by all. It was a great way to relax and wind down after the workout. Stay tuned in February for the Health & Fitness Department's special four-class cardio schedule, which includes cardio kickboxing, step aerobics, Balletone and boot camp classes. For more information on the upcoming cardio schedule, see Page 46 of the February Link. The Link Advisory Committee bade farewell to its SCSCAI Board liaison Ken Caroccia following its monthly meeting on Friday, January 25, at Desert Vista. 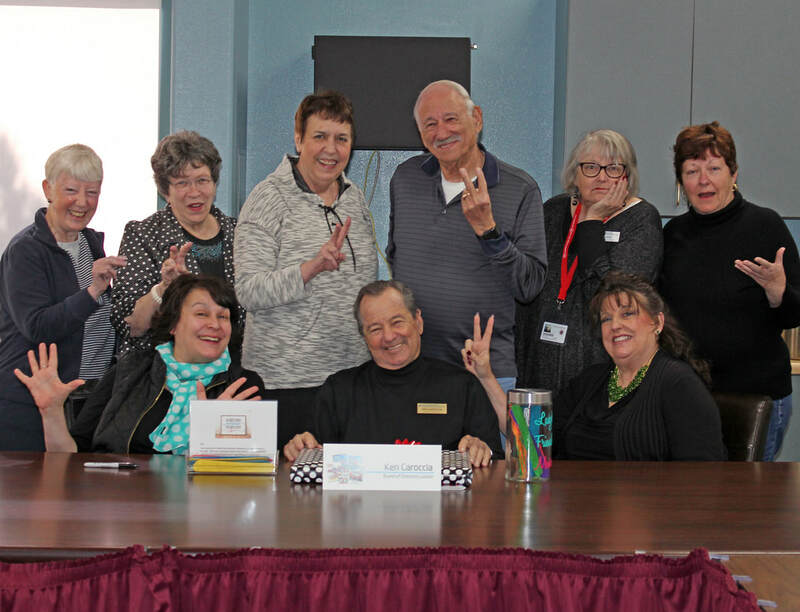 Ken has served as the Link Committee’s liaison for five years, keeping Sun City’s Board of Directors apprised of Link business and assisting the committee with various issues over the years. The Link Advisory Committee thanks Ken for all his hard work on the magazine’s behalf, and wishes him a restful retirement. The Link welcomed 32 advertisers to its 3rd annual FANFARE on Saturday at Desert Vista, in addition to more than 500 residents who visited the vendor tables collecting information and meeting representatives of the businesses that support our community via the monthly magazine. 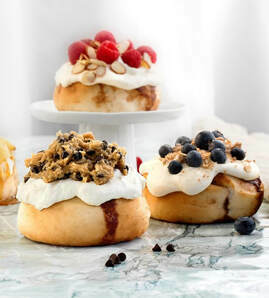 “This year’s FANFARE was amazing, with both advertisers and residents giving us lots of positive feedback throughout the morning,” said Jeannette Carrillo, Link managing editor. 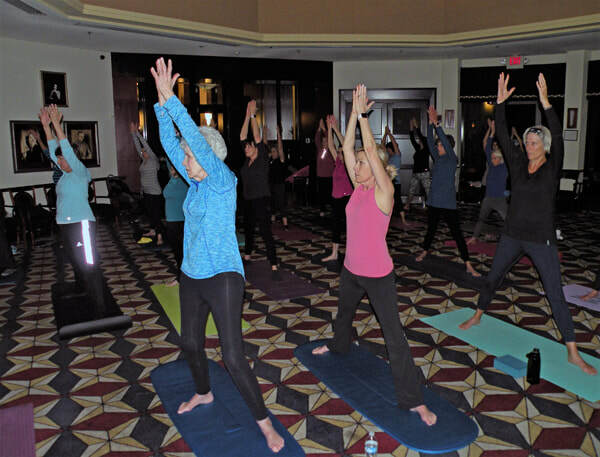 “Several vendors reported that they had booked appointments with residents for later in the week, while others said they had a great time meeting and educating visitors on everything from tree trimming to estate planning and real estate to upcoming shows at The Smith Center. The list of participating businesses included Acacia Springs, Advanced Manual Therapy, Affordable Insurance, Air Pro Masters, Cabinet Craft, Corinne Cherek, Comfort Keepers, Home Realty Center, Jan Fowler Real Estate, Jerold E. Creed Law, John Lee Mestemacher, Kitchen Tune-Up, Miller’s Tavern at Palm Valley, Mimi’s Café, Neptune Socieity, Nevada Eye Physicians, Paul Gerber, Pebblestone Coating, Ready Golf Cars, Richard Turk Contractor, Sean Tanko, Attorney, See Right Now, The Smith Center, Specialists Real Estate, Southwest Medical, State Farm Insurance, Sun City Summerlin Food & Beverage, Team Linda Stewart Real Estate, Three Dog Bakery, Trobough Dental, Woody’s Tree Service and XYXY Mailbox Man. Sun City Summerlin Security Patrol and SCSCAI’s Neighborhood Preparedness Team also attended the event. Four By Four serves up a song favorite by the Beach Boys for audience members at The Starbright Theatre. Photo by Stu Gershon/Link.